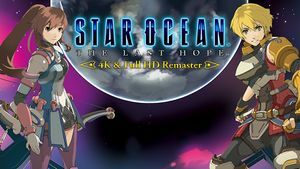 Remaster of Star Ocean: The Last Hope for consoles; improvements include upgraded visuals and 4K support. Game logic seems to be tied to fps, the game runs too fast above 60 fps. DualShock 4 and Nintendo Switch Pro Controller buttons prompts. Separate sliders for BGM, SFX, battle voice overs, and cutscene voice overs. See localization subs. Dialog outside of cutscenes (i.e. battle voice overs) are NOT subtitled. See Helix Mod: Star Ocean - The Last Hope -. Right click the Speaker icon on your Desktop Taskbar and click "Playback Devices"; Or open Control Panel and click on "Sound". In the drop down box under "Default Format" select the option using your current channel and bit depth setup with 44100khz (IE: 6 channel,24-bit,44100 Hz). ↑ 1.0 1.1 File/folder structure within this directory reflects the path(s) listed for Windows and/or Steam game data (use Wine regedit to access Windows registry paths). Games with Steam Cloud support may store data in ~/.steam/steam/userdata/<user-id>/609150/ in addition to or instead of this directory. The app ID (609150) may differ in some cases. Treat backslashes as forward slashes. See the glossary page for details.